I was lucky enough during New York Comic Con to score a plumb seat: on Main Stage 1-D, in front of 500 or 500 screaming fans, interviewing Michael Rooker. If you’ve never been to Comic Con before, let me tell you, it’s a madhouse. More than 200,000 went to the New York convention this year. For a first-timer, it is entirely overwhelming; it certainly was for me. There’s too much to see, to much to do, and the crowds are way, way too big to wade through. Getting from one end of the Javits Center to the other – the equivalent of about three city blocks – can take 30 minutes. It really is that crowded. I’ve spoken in front of big audiences before, but I’m not sure I ever was in front of a crowd this big. Also, most of my public speaking has been related to bitcoin or markets. Bitcoiners are a passionate bunch, but not exactly rowdy. These Rookerholics, as some of his fans call themselves, are a different breed. This was a fired-up crowd before I even walked on the stage. You can watch the whole thing for yourself here. If you haven’t seen Rooker do one of these interviews before, understand that this is not in any way a normal interview. I was warned, specifically, beforehand: he likes to pick up his interviewers and turn them upside down. I do believe it was meant literally. Now, fortunately for me, I had seen Rooker before, at the Charlotte Walker Stalker convention. His talk ended up making it into chapter 10 of “Guts.” So I knew what I was getting into. This is the cover for “Guts,” coming in October. Tony Moore, who was the first artist on “The Walking Dead” graphic novels, did the cover illustration for us. We were lucky to get Tony, who is a talented and well-known artist and obviously gets zombies. This image is a perfect representation of what the book is going to be all about, which is dissecting this popular TV show and trying to figure out just what about it has resulted in its becoming such a global phenomenon. This week I sat down with Manu Saadia, the author of “Trekonomics.” We had a great, wide-ranging talk, about Star Trek and the vision of the future laid out by Gene Roddenberry. We talked about the elements that contribute to the economics of the 23rd and 24th centuries, and we explored how many of those elements are either with us today, or exist in very nascent form. It’s very surprising to find that nobody’s ever written a book about the economics of Star Trek before. You’d think somebody would have. What fascinating about it is that the path to the kind of world Roddenberry envisioned will have as much to do with economics and politics as technology. Getting to a world where people work together, and racism and poverty is a thing of the past, may not be a question of technology, but rather politics. The tools will exist, the question is how will they be distributed. Ultimately, the question of whether our future looks like Star Trek or Terminator is less about the machines than it is about mankind. Have a listen. This was possibly my favorite podcast yet: Star Trek, economics, and even some bitcoin thrown in there, too. By the way, that’s not exactly the bridge of the Enterprise in the picture up top, but it’s close. It’s from the exhibit at Star Trek: Mission, the convention at the Jacob Javits Center this past weekend. It was built by James Cawley and his team, a group that’s been making Star Trek fan films for about 15 years. 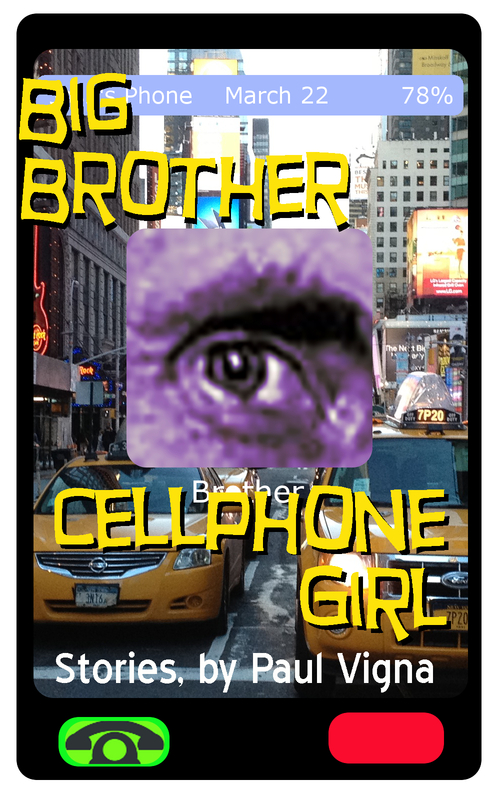 Here’s the cover I’ve worked up for the pair of short stories that soon will on sale at Amazon, Big Brother and Cellphone Girl. Now that Super Bowl XLVII is over, and the Ravens barely held on, the countdown is on to Super Bowl XLVIII, the one being played in the winter climes of northern New Jersey. We had the NFL’s all-time leading rusher, Emmitt Smith, on the Markets Hub the other week, and we asked him about playing a Super Bowl in the cold, as well as which running back he thought would do better and who we wanted in the game (he was pulling for the Ravens). Dear Hollywood producer, I know how to make Zen and the Art of Motorcycle Maintenance into a film. I first read the Robert Pirsig novel about a quarter century ago. Over the years, I’ve gone back to it again and again, re-reading it, then re-reading it again, every time drawing new insights from it. I’ve surely read the book more than a dozen times, I don’t know, I lost count; at one point, I was reading it once a year. I also read all, I think all or most of the books that Pirsig references in the book: Walden, Tao Te Ching, Plato’s Phaedro and The Meeting of East and West, a philosophy book by a little known Yale professor, FSC Northrop, that Pirsig mentions only once, but notes it was a critical book for the narrator. I found it by chance in a used-book store. Took me nine months to read it; it literally was the densest book I’d ever picked up. Very time-consuming, but valuable read. So you can see I’m serious. I also spent a lot of time trying to write screenplays. For some odd reason, I thought this was a realistic career path for me. I probably wrote ten or so. Never sold any of them, didn’t try hard enough reckon, but I did learn at least how to write a screenplay. All of this makes me the perfect person to tackle a Zen screenplay. Now, Zen is one of those books that seem impossible to translate onto the screen. Indeed, any filmed version of this novel would fall short of the book itself, unless you wanted to make a 12-hour film with endless flashbacks and exposition. But I do think there’s a way to make a good, solid, even commercial film out of the book that would do justice to Pirsig’s story and philosophy (I know Pirsig himself isn’t interested). I’m not sure if I’ll ever find the spare time to actually write this screenplay, so I might as well just flew out my general ideas here, for posterity’s sake.